The following articles include the latest news and information on United States Mint coins and products to include new and upcoming coins, coin designs, release dates, sales, mintages and announcements related to collecting and coin collectors. 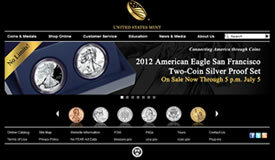 Recent US Mint news and articles are directly below. To quickly scan or jumped to articles of interest, check out the linked coin news headlines shown in the two columns to the very right. Vibrant American Bald Eagle coin designs were released December 5th, 2007 and the US Mint pulled away the curtains to offer them for sale on January 15, 2008. A $5 gold coin, a $1 silver coin and a half-dollar clad coin all honor the American Bald Eagle in 2008. These three coins are also issued in special commemorate Proof and Uncirculated versions. Information, high quality coin images, prices and ordering information are below. Striking of the first Oklahoma state commemorative quarters began in the U.S. Mint’s Denver facility this week with a single ceremonial push of a button. While the quarter is now going through its production paces, it won’t enter public circulation quite yet. Hundreds of millions will be minted and then placed into circulation later this month. 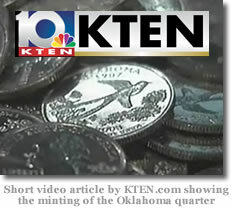 The video article by KTEN.com is currently the best source to see an actual photo or image of the Oklahoma quarter. Presidential $1 Coins: ‘In God We Trust’ Motto Moves in 2009. Are Coin Edge-Letterings Gone Forever? A flood of stories has appeared regarding the forthcoming movement of "In God We Trust" from the edge to the face of Presidential $1 Coins. They all started with President Bush’s signing of the Consolidated Appropriations Act of 2008. CoinNews wrote about the legislative scrutiny in changing the motto’s location, expected the signing of the final legislation, reported about it minutes after it was signed and then surmised that the Presidential Dollar coins would not see change until 2009. The United States Mint offered up a sneak peek of the four Presidential $1 Coins scheduled for release in 2008. With such high mintage numbers, you would expect the coins to be readily available and used in daily transactions. That Mint desire is a long distance from reality with the Presidential $1 Coins nearly invisible outside the coin collector community. “We hope the next four presidential $1 coins will not only jingle in pockets but be spent as well. These coins are convenient. Each presidential $1 coin weighs less than four quarters, and they’re especially useful for vending machines and mass transit." 2008 would seem to be the year the Mint will focus more on the new dollar coin’s compatibility with vending machines, their ease in use with transit systems and getting banks on board to supply them. 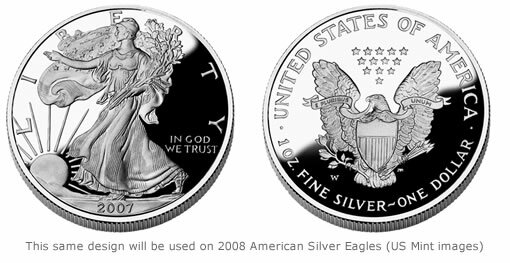 Next Thursday, Jan. 3, the 2008 American Eagle Silver Proof Coin will go on sale by the United States Mint. While the 2007 proof version is currently sold for $29.95, its days are numbered and the Mint has announced its newer replacement will sale for $2 more, at $31.95.